James A. Stack, Sr. was a collector of substantial means and discrimination who was active in numismatics from the late 1930s until his death in 1951. He acquired many rarities and “finest known” coins by taking full advantage of the opportunities presented to him as great collections came onto the market. He owned an 1894-S Dime, a 1798 Small Eagle $5, an 1870-S Silver Dollar, an 1838-O Half Dollar, and hundreds of other U.S. coins including condition-rarities, pattern coins, early Proof coins, and Pioneer gold. Portions of his collection were sold over a 20 year period beginning in 1975. Had his collection been sold as a single unit, it would have been one of the landmark auctions of the 20th century. Nonetheless, the James A. Stack pedigree signifies importance, rarity, and quality. The following auctions contained important portions of the James A. Stack Collection (note: Stack’s, the New York auction house, was no relation to James A. Stack…they just shared the same name). This auction was the first introduction to the treasures that awaited in the James A. Stack Collection. This was a stand-alone sale (no outside consignments) of Mr. Stack’s Quarter Dollars and Half Dollars. Highlights in the Quarter section included a Mint State 1804, a Proof 1827 Original, and a Proof 1842 Small Date. Standouts among the Half Dollars included an 1838-O, a Branch Mint Proof. 1861-O, and a Gem 1892-O Micro O. The second installment of the James A. Stack Collection included his U.S. Large Cents. This was the only time that a firm other than Stack’s was chosen to present Mr. Stack’s coins. This sale offered Mr. Stack’s Colonial Coins followed by his Half Cents through Half Dimes. Highlights included a 1792 “Roman Head” Washington Cent with a blundered edge, an 1811 Restrike Half Cent, Proof-only Half Cents of 1831, 1836, and 1840-1849, an AU 1792 Half Disme, several Mint State Half Dimes of the 1794-1795 period, and an 1802 Half Dime. The 1894-S Dime from the James A. Stack Collection headlined this sale. Also included were his collection of U.S. Dimes and his Private and Territorial gold coins. Dimes must have been one of Mr. Stack’s favorite coins because the quality and depth of his collection was exceptional. He had a Mint State 1809 Dime, Proofs of 1820, 1822, 1824, and 1825, as well as numerous later dates. His selection of Pioneer gold was small, but included two $50 “Slugs”, an 1849 Mormon $20, a Gem Clark, Gruber & Co. Half Eagle, and numerous California Fractional gold coins. Nearly 2,000 lots were offered from the James A. Stack Collection of U.S. Paper Money, many of which hailed from the celebrated Albert Grinnell Collection of more than forty years earlier. From Demand Notes, Legal Tender Notes, Silver Certificates, Treasury Notes, Gold Certificates, to National Bank Notes, and even Colonial Currency, this collection included highlight after highlight. This sale included a nice run of gold coins from the James A. Stack collection. Highlights included a nearly complete set of Gold Dollars, a Proof 1821 Quarter Eagle, an 1841 Quarter Eagle, 20 early Half Eagles dated from 1795 to 1807, an 1819 Half Eagle, and hundreds of other high-quality Mint State and Proof gold coins. I haven’t been able to locate a copy of this catalog, but I am almost certain that this sale would have included world coins from Mr. Stack’s collection. I’ll update the post as more information is uncovered. 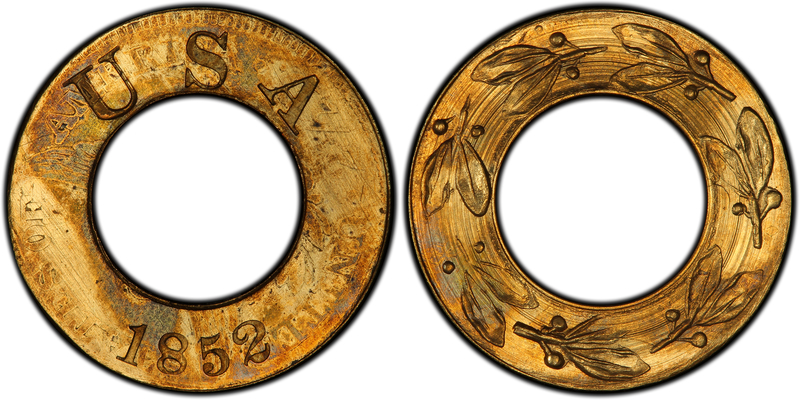 Some of Mr. Stack’s world coins were included in this sale, but, unfortunately, very few (if any) were identified as having originated with his collection. No additional sales of James A. Stack coins have occurred since 1995 with the exception of reappearances of individual coins, and it is doubtful if any more coins are held by his estate or descendants. As desirable as the James A. Stack pedigree remains today, there are many instances where his name has been stripped, intentionally or otherwise, from the ownership chains. Reattaching his name, which occurs fairly frequently, is a pleasant by-product of my work on the PCGS CoinFacts Condition Census. In fact, discovering one of those connections is what brought my attention to this remarkable collector.